Whether you’re a dedicated Fritz the Cat fan, more of a Mr. Natural-type, or simply enjoy the odd perusal of his finely illustrated realm of sexual obsessions, you might know that Robert Crumb (a.k.a. 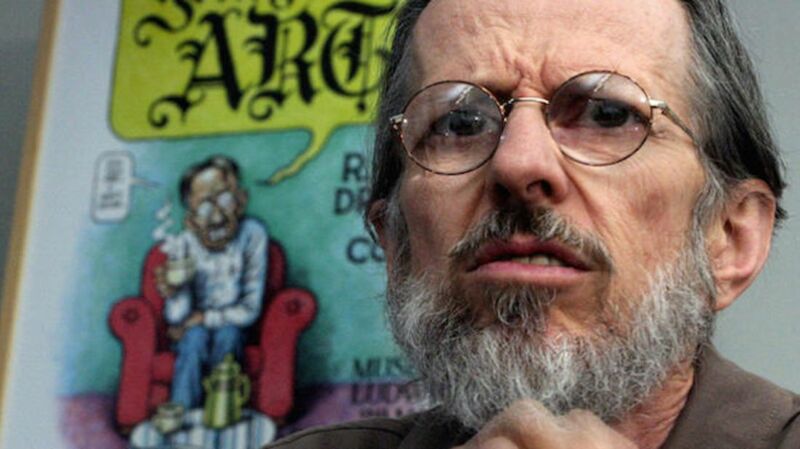 R. Crumb) likes his women ample, his art nonconformist, and his bitterness self-referential. In honor of the publicity-shirking cartoonist’s 72nd birthday, you might do well to plunge even deeper into Crumb’s squirrely, squiggly world to discover some lesser-known facts about the guy who brought underground comics into the anxious, sweaty mainstream. 1. HE DREW A VERSION OF HIS WIFE BEFORE THEY EVER MET (WHICH IS HOW THEY GOT TOGETHER). 2. HE PLAYS BANJO AND UKULELE IN TWO OLD-TIMEY BANDS. The mostly string-based bands R. Crumb & His Cheap Suit Serenaders and R. Crumb and His Keep-on-Truckin’ Orchestra have been playing old-time, ragtime, folk, bluegrass, and blues music for decades, and feature classic themes but also ones that directly affect self-critical artists. 3. HE’S DONE THE COVER ART FOR SEVERAL ALBUMS (INCLUDING HIS OWN). As Rolling Stone reported, Crumb isn’t just an avid record collector, he has also designed the covers of a number albums ranging from his band’s releases and a compilation of female singers to Big Brother and the Holding Company’s 1968 hit Cheap Thrills. He created the latter as a “work for hire” in one night for just $600, and told Rolling Stone he enjoyed working with Big Brother singer Janis Joplin: "Janis used to come around, smoke pot, talk about the comics … She was nice." For several other album cover jobs, he has happily accepted payment in vintage records. He won’t do work for bands he doesn’t like, though—the Rolling Stones included. 5. HE MADE AN (ACCURATELY) ILLUSTRATED VERSION OF THE BOOK OF GENESIS. “I think that the best public service that it has to offer is that it brings everything out. It illustrates everything equally. Even the strangest stories, stories that don’t make much sense. The Bible was not written for entertainment purposes so it’s a real hodgepodge and a compendium of all kinds of stuff." 6. LIKE HER PARENTS, SOPHIE CRUMB IS A SUCCESSFUL CARTOONIST. While her life has certainly taken its own directions (her marriage, for example, is not an open one, like her parents’), 33-year-old Sophie Crumb picked up the family pen and became an accomplished cartoonist and artist in her own right, and with a style that shows hints of the aesthetics and tones in Robert and Aline’s work.